The General Overseer, Pr. 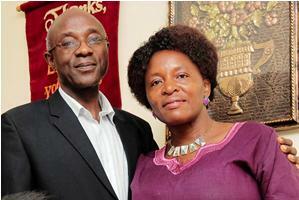 Edward Kiwanuka with his lovely wife, Monica. the soldiers came down and ordered all students to come out. We bid our brethren farewell. night we were transported in three batches to Luzira maximum security prison”. During a Wednesday afternoon service, men armed with AK-47s attacked the church. The service leader blew a trumpet and commanded everyone to kneel down and pray in tongues. The soldiers later ordered us to crawl to a small compound in front of the church building and lie flat on our bellies, from where we were loaded onto a truck and driven off to a place which I learnt later was the most feared Nakasero State Research Bureau known for it’s dungeons and torture chambers. Upon arrival we were off-loaded gathered in one group at the entrance of one of the buildings, I overheard one of the soldiers ordering for gasoline so they set ablaze some of us to set a lesson for the others. This by the grace of God didn’t happen. I was stripped of all belongings together with the other members, the shoes and belts and everything was taken and later led into an airtight lipped dark room where there was hardly any space for one to squat. While there I remembered how I remembered how it had all started….. 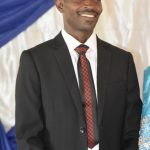 I got saved in the third term of senior two when university students from the then only university­ Makerere, who included Sam Wamboga, Olive Kyoheirwe (then Kafeero) and Swithin Kyamuresire came to minister to non­catholic students at St Mary’s College Kisubi where I responded to an altar though I didn’t fully understand its significance. I could later learn that it was the best and most important decision I have ever taken in my life. I got introduced to Deliverance Church by a school mate Nicholas Masozera during the school holiday that followed. Before, I attended early morning service at All Saints Nakasero. One-day, Nicholas offered to take me to the church where the people who had led us to Christ met. During that time Deliverance Church Kampala met at YMCA­ Wandegeya. My experience of a first Pentecostal Sunday fellowship was in 1975 and everything I saw was very new to me. I was used to a quiet, orderly and liturgical service, but this one was noisy, vigorous, not very structured but captivating. Some people were speaking in a language I did not understand, while others were singing with a lot of energy and sweating profusely. Later in the service, pastor Stephen Mungoma stepped forward to share the Word. I could only make it to church during the holidays because I was in a boarding school and stayed with my brother in Kamwokya before relocating to Kabowa then to Bunga, still the distance never deterred me. When the church was banned in 1977 I was not a grounded member of the Cell fellowship so I lost touch with the brethren and went back to Christ the king. During April 1978, I somehow learnt through a church brother, Richard Jawino, that Full Gospel Church had re-registered under a new name ‘Glad Tidings Incorporation’ as a company without guarantee, and that they were going to open their churches under the new name. My thirst for the Pentecostal style of worship drove me to their fellowships to enjoy the beautiful Sunday worship. him at the Bureau, kept firing at the organ (piano) on the platform in the church where some people were had hidden, no one was shot. After the incident at the church hall, trembling in fear, the soldiers commanded us to crawl to a small compound in front of the church building and lie on our stomachs, then they commandeered a lorry, loaded us on and drove us to Nakasero State Research Bureau. As we sat at the entrance of one of the buildings, one soldier told his colleagues to order for fuel so they can burn five of us for others to learn. Thankfully this did not happen though we had had of stories of how people brought to this place could be set ablaze. I and other brethren were stripped of all our belongings including shoes and belts and later led to a dark humid airtight lipped room where you could not tell what time of day it was. These rooms had each only a metal grill door which served as an entrance and only ventilation. At the beginning I was near the entrance so I had a breath of some fresh air. I retreated to the inner part of this congested room for fear of being shot after I overheard gunshots and footsteps of soldiers nearing to the door. The inner part of the dungeon was terribly humid and squeezed in a way that one only had room enough to squat very closely. Though I never witnessed, we could hear gunshots which was an implication of some shootings of people. Gripped with fear, the leaders among us instructed us to hold a chain and we began to pray. We kept in prayer, dosing off a bit and when your turn came to pray you prayed quietly and on numerous occasions reciting the bible verse in says in 2 Corinthians 10:4­6 that says​ “our weapons are not carnal, but they are mighty through God to pull down strongholds ​ . Let us employ them­ prayer, the Word, the name of Jesus, love, forgiveness, the blood of Jesus and all others”. After about twenty hours in the detention the soldiers came down and ordered all students to come out. This caused a lot of anxiety, we did not know why we being called, we bid our brethren farewell and were led to the entrance. When it grew dark ,we were put on a truck and driven to the Central Police Station in Kampala where we were served a meal of Posho with beans. While here we had it in mind that we were to be released. Unfortunately later that night we were transported in three batches to Luzira maximum security prison. We learnt much later that one Obura had stopped the release of students because that would cause chaos out there. At Luzira I was in the first batch, upon arrival at the gate we were frogged thrice, that night the sudden cold from the nearby lakebreeze got us all shivering. When morning came we were ordered out paraded and given two new blankets and a plastic mug. Since we were detainees, we never went out to work like other prisoners. Our main duty was to receive visitors who brought along with them foodstuffs and bibles for us. This kept our spirits high together with the daily fellowship with one another which was carried out in intervals, it increased our hope in God. We only interacted with other prisoners during the day before they went to workshops and after, It was during that time that we shared our faith with them and a number received Christ. On a Saturday 30​th​ June 1978 after two and a half months in prison were released. We later learnt through a rumour that president Idi Amin had assigned his Vice, Maj. Gen Mustafa Adiris the task of killing us and that body bags had been prepared for the disposal of our bodies. Around that same time, the Vice President got involved in a serious motor accident on Jinja Road and was airlifted to Cairo(Egypt) for treatment. That is how we escaped death. Prison taught me how to share the word, made very good friends and became very courageous. If I had remained out of prison and only heard that some Christians had been arrested and imprisoned, I probably would have drawn back due to fear. The courage drew me into looking for where the underground cell that I belonged to had relocated. I still count that loss as gain, because my life is in his hands. He makes all things­good and bad, sweet and painful to work for good for those who love Him and are called according to His purpose in Christ Jesus (Rom 8:28). God turned around that which the enemy meant for evil. Glory be to God . A great ministry has grown into a great force with men and women over the world advancing the kingdom of GOD. Am very grateful that am part of this ministry. God bless and use you to bring revive. Next post PASTOR, ELDERS ORDAINED IN MASAKA.